BRISBANE, Jan 9, 2016 – All the very good young players want a piece against the Big 4-plus 1. On Sunday at Brisbane, Milos Raonic will face Roger Federer in the final. The Canadian Raonic is 25 years old and, at least this week, he has looked a little better than last year when he was hurt from the spring until the end of the season. Now, he is saying that yes, he can win a major this year and yes, he really has improved during his off-season. His first and second serves are huge, his forehand is gigantic and when he can sense his foes, he can move quickly and crack his returns very deep. His backhand is a little more solid now and when he is feeling comfortable, he will charge the net and take it over. But the reason why he has yet to win a Grand Slam is because he is too stiff, his could use some more variety, he can get stuck behind the baseline, and he can be too predictable. Head to head, Federer has beaten Raonic nine times and the Canadian has won just once, in 2014 Paris/Bercy. OK, Raonic has been somewhat close, but he can’t push over the hill. Last year in the 2015 Brisbane final, Federer beat Raonic 6-4 6-7(2) 6-4. Raonic was nearly untouchable with his searing serve, but he just couldn’t break him. As Raonic said, it’s hard to figure out the great Swiss, because he can go whatever he wants to. Federer has been a little bit sick this week, but now he is feeling better. The 34-year-old is aging, but last year, he won six tournaments and he was extremely efficient. He can chip and charge, he can spin his backhand so low and true, he can crush his forehand both ways, or he can chuck in a coupe soft drop shots. Eventually, the young, very good players will beat the “old” veteran, but Federer is still ranked No. 3, he reached two majors finals as well as the ATP Finals, and the only guy who took him down in those events was impenetrable No. 1 Novak Djokovic. Can the No. 14 Raonic topple him? He certainly has the shot, but Federer is the favorite and he seems to be pretty comfortable. 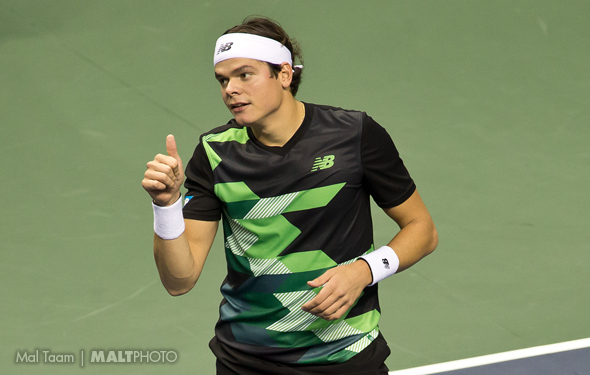 Raonic has to seize his opportunity – quickly.